Richard Mootz, DCH Brunswick Toyota: "My advisers would not go back to a PC behind a counter." 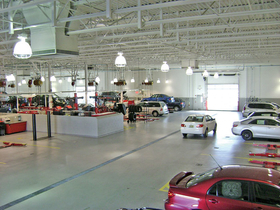 In 2007, DCH Brunswick Toyota opened a 52,000-square-foot stand-alone service center in North Brunswick, N.J., with 45 service bays and three customer lounges. The old service area, which had been attached to the dealership, had 21 bays. But the timing, just before the recession, was abysmal. Business began to sag in late 2008. The weak economy cut new-car sales, and improvements in quality meant that the cars that were sold needed fewer repairs. To stop the slide, the dealership turned to digital technology, from hand-held computers in the service lane to 24-hour live online chatting with customers. Now a key indicator -- dollars per repair order -- is climbing; so-called menu sales, which are packages of accessories and services, are up; and staffing is back to pre-slide levels. "We built this wonderful 'Garage Mahal,' we had to fill it. We are doing that through the digital world," says Richard Mootz, director of fixed operations. One effective digital addition was the Wireless Service Advisor from MOC1 Solutions of Glendora, Calif.
Two years ago, Mootz's service lane advisers began using hand-held personal computers loaded with MOC1's software. The computers connect to the dealership's management system. Standing at the vehicle, advisers see the service record, inspect the vehicle, record any new problems and make service recommendations. Customers can sign an authorization for service on the computers. Being at the car writing up the order rather than behind a desk helps advisers learn more about the car and make sound recommendations in the customer's presence, Mootz says. Since switching to the hand-held computers, menu sales are up nearly 13 percent, says Mootz. Tire sales jumped from 75 a month to 500, he says. The hand-held computers also have increased work on vehicles subject to safety recalls, he says, because seconds after entering the vehicle's identification number advisers can see any recalls announced for the model. MOC1's basic write-up software costs dealerships $699 per month for up to five users. After that there is a $49 monthly charge for each additional user. Dealerships can add options such as the multipoint inspection plan or the recall info software. The average price per store is about $1,000 per month. The service department laid off seven people, or 13.5 percent of its staff, in 2008, but staff now is back above pre-layoff staffing levels because of the extra business the tablet PCs generated, Mootz says. "My advisers would not go back to a PC behind a counter," he says. DCH Brunswick Toyota sold 2,275 new vehicles in 2010 and 993 used vehicles. Loading the Web site with information in two languages -- Spanish and English -- was another improvement. Also, tire prices now are listed on the site. Customers can make a service appointment, get a quote or apply for credit online. And, collision center customers can check progress of repairs online. There are helpful frequently asked questions that explain, for instance, the different sources for replacement parts: factory, aftermarket or salvage yard. The service center page now gets more than 1,000 hits a month, more than triple the number the old site received, Mootz says. The parts section alone gets 350 hits, he says. If all of this seems like information overkill, think again. "If a customer needs something, they go to their computer," says Lloyd Schiller, a service-industry consultant in West Palm Beach, Fla. A service center page needs "all the pizzazz" of a dealership's new and used car Internet page, he says, so it will appear high in an Internet search. Listing prices also helps because it wins customers' confidence, Schiller says. Six months ago, DCH Brunswick Toyota added a button at the top of each page that lets customers type questions and receive answers from the dealership 24 hours a day. Up to 85 people a month log into the live online chat, and the dealership is getting more service appointments as a result, says Mootz. Some customers still like to talk to a human rather than type to a computer when they need service. So a person is on duty around the clock at the dealership to answer the phone. And customers can drop off vehicles for service 24 hours a day. The tone of the dealership's communication has changed from hard-sell to soft. The staff is no longer "swinging for the fences" -- trying to sell as much as possible to each customer, he says. Instead, they discuss the vehicle's needs and point out areas that need immediate attention, says Mootz. The goal is to keep the customer coming back. Of those who buy their car at DCH Brunswick Toyota, 55 percent come back for service within the first year, up from 48 percent two years ago. The goal is 80 percent, says Mootz. "We have a plan for retaining them through seven years of ownership," he says. More digital changes are coming. A new drop-down menu feature will allow customers to enter a vehicle's year, make, model and mileage and select the level of service they desire, based on price. The hand-held computers used by the service advisers already are equipped with the drop-down menu, says Mootz. It helps keep the staff focused on retaining customers rather than just selling them a lot of service, he says. Says Mootz: "We've embraced the digital world to communicate with customers and to change their experience."